Every so often we get down into the nitty-gritty details of an item. In today’s post we dig into the details of the Reverse Repo. What follows is information explaining a term that we feel you are better off knowing in the future as it may become common rhetoric when the Fed begins slowing stimulus of bond purchases. A Reverse Repo is the selling/handing out of money at a SPECIFIC discounted rate with the intent of buying it back VERY quickly at a designated value to help control short-term interest rates. That’s it … If you take nothing else from this post but the above…You got it … Just please remember the term for the future as we believe it will become more common in the near term !! What is a Fed reverse repurchase agreement? The Open Market Trading Desk (the Desk) at the Federal Reserve Bank of New York (New York Fed) is responsible for conducting open market operations under the authorization and direction of the Federal Open Market Committee (FOMC). A reverse repurchase agreement, also called a “reverse repo” or “RRP”, is an open market operation in which the Desk sells a security to an eligible RRP counterparty with an agreement to repurchase that same security at a specified price at a specific time in the future. Thus, the Desk receives cash from the counterparty and then returns cash at the specified time in the future. The difference between the sale price and the repurchase price, together with the length of time between the sale and purchase, implies a rate of interest paid by the Federal Reserve on the cash invested by the RRP counterparty. When the Desk conducts an overnight RRP, it is selling an asset held in the System Open Market Account (SOMA) with an agreement to buy it back on the next business day. This leaves the SOMA portfolio the same size, but shifts a liability on the Federal Reserve’s balance sheet from “deposits” to a reverse repo while the trade is outstanding. A “repo,” or “RP,” is the opposite transaction, where the Fed purchases a security from a counterparty with an agreement to sell it back at a later date for a specific price. Thus, in this case the Desk lends funds to the primary dealers. 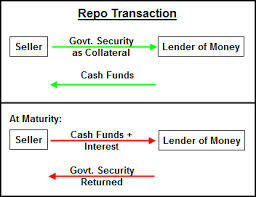 A repo creates both an asset on the Fed’s balance sheet (the repo) and increases the “deposits” liability. “The purchase of securities with the agreement to sell them at a higher price at a specific future date. For the party selling the security (and agreeing to repurchase it in the future) it is a repo; for the party on the other end of the transaction (buying the security and agreeing to sell in the future) it is a reverse repurchase agreement. Why the Reverse Repo discussion now? Talk of this began in January of 2013 and has made it’s way further into the Fed’s notes in greater detail as of late. The Fed has begun testing this method through counterparty assignments per their latest notes. It will eventually commence. Now…if you are still awake, zzzzzzz … you are prepared !! This entry was posted in Education, Interest Rates, Investing/Financial Planning and tagged FOMC, J.K. Financial, NY Fed, Reverse Repo. Bookmark the permalink.